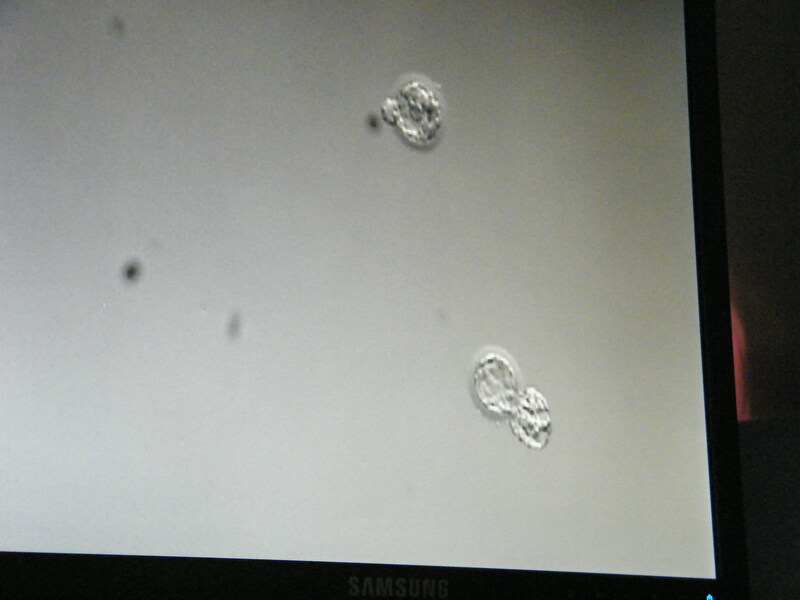 Here they are … our transferred embryos! The embryo on the bottom right is Embryo #15, our best blast and a 5AA (which was hatching). We saved our second-best embryo (a 6AA) for a future transfer and instead transferred Embryo #21, a 5BA. The 5AA re-expanded 95% after thawing, which is really good. The 5BA only moderately expanded at about 75%. The 5BA is a Day 6 blast, so that may have something to do with the slow expansion. Dr. Surrey said they both looked beautiful and he is optimistic. The embryologist said she sees twins result from embryos like ours, so we are happy that the professionals were happy with our blasts. As long as one sticks, we will be overjoyed. This entry was posted on January 13, 2011 at 6:46 pm	and is filed under Embryo Transfer, FET. You can follow any responses to this entry through the RSS 2.0 feed. You can leave a response, or trackback from your own site. Thanks for the pictures and the post. They look beautiful! Have a nice night. I thought of you all day and told my friends about you too. Those embies look gorgeous – congratulations! I’m sorry the connection in the hotel is slow – I wonder what’s going on? I never had that problem there, and I am an internet junkie. Congratulations on your transfer! Your embryos look beautiful! I think u should def be ready for twins!! Glad it went well! Whooo hooo!! You’re PUPO!! Take care!! hope they’re holding on for dear life! literally! Great looking blasts!! Wow!! Picture those blast latching on and plugging into you. Talk to them and tell them to take everything they need from you; their Mommy:) Get rest and know we are all rooting for you!! They both look great!! Congratulations and hope you are relaxing and enjoying your bedrest! I have a really good feeling about this! Look at your beautiful, beautiful babies! Congratulations! They look GREAT! So happy that Dr. Surrey is optimistic. Fingers crossed! This is a really late response, but I’ve been thinking about you ever since 2pm on Thursday! I was sitting in a meeting glanced at the clock and thought, “AuntieEm’s” probably driving over right about now. I know the double transfer is scary, but it’s just one more layer of “do whatever it takes” that you’ve added, and that’s a good thing!!! Hoping the best for you, and that bedrest is treating you well. We’ll have to talk soon, missed meeting you! Your embies are beautiful! Congratulations – enjoy being PUPO. Take this time to just be in the moment!